Only two days are left for all teaching professionals to apply for 513 Teacher Vacancies Notified by SSC. According to the notification issued by Jharkhand SSC, there are 513 vacant positions for Teachers (PGT) and the selection will be done through exam. 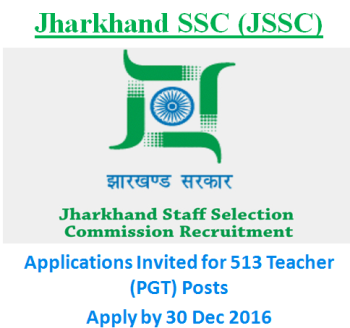 Jharkhand Staff Selection Commission (JSSC) invited applications for recruitment to the posts of Post Graduate Trained Teacher (PGT). The eligible candidates can apply online to the post in the prescribed format along with necessary documents on or before 30 December 2016 @jssc.in. Educational Qualification: Candidates applying for Jharkhand SSC Teacher jobs must be Post Graduate in the concerned stream of Chemistry/ Physics and History. Eligible candidates can apply online to the post along with other necessary documents on or before 30 December 2016 at jssc.in. Only two days are left for application date to close, apply soon.